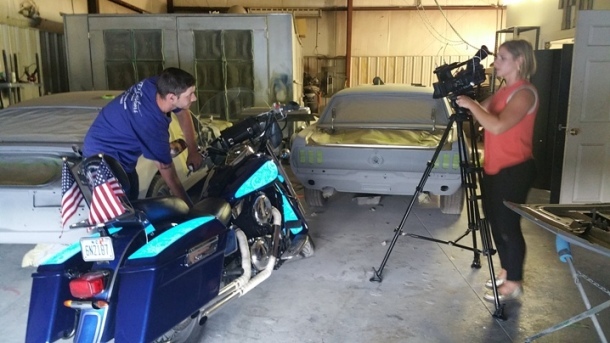 FOX Carolina 21 visited TD Customs in Mills River to show the community what Lumilor electroluminescent paint is all about and how it can help motorcyclists be safe while they’re out riding. There were two videos featured on their evening news program, and an article to accompany it. Check out the article below. 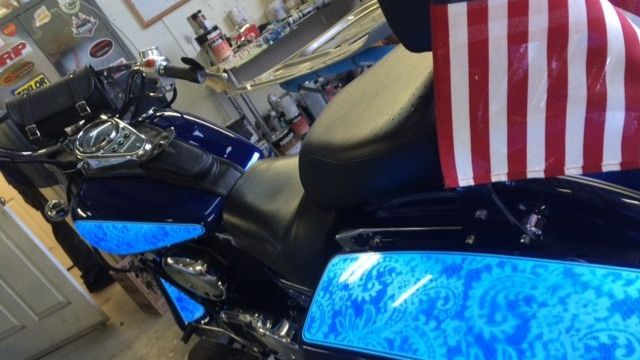 GREENVILLE, SC (FOX Carolina) – There’s a new kind of paint on the market, and it’s helping to raise awareness about motorcycles on the road by making the bikes more visible. It’s called Lumilor paint, and there are only four shops in the country that can apply the special paint. One is in our area. 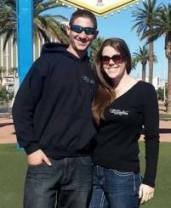 TD Customs is owned by Tim and Tara Donaghue. Tim received special training last fall to apply the paint, and now does it out of his shop in Mills River. Donaghue said the new paint is also about an added safety feature. He and his wife like to ride their motorcycle, and know how dangerous it can be on the roads. In South Carolina, the State Highway Patrol said that since the paint is so new, they had to research if any of the current laws on the books would apply to this special paint. Donaghue said there haven’t been any issues with his bike, which is painted blue, and local police officers he spoke with didn’t see a problem with it as long as the lights weren’t flashing. Donaghue said it costs $4.50 a square inch to apply the paint, and takes just a few days for the job to be done. He said the Lumilor paint is also available in green, white, aqua and orange, and can be applied to other surfaces besides vehicles and motorcycles. For more information on this awesome new paint, check out our Lumilor page! No Replies to "New paint looks to shine light on motorcycle safety"